Val is a small, black male who was found as a stray in Alvarado. He is named after the kind woman who has been feeding him for weeks now, but has been unable to get close enough to capture him. A GALT volunteer took our humane trap down to Alvarado and helped Valerie place it where she was leaving food for Val. He went into the trap the same day, and was transported straight to the GALT veterinarians at Preston Park Animal Hospital for evaluation. Val weighs only 39 pounds and appears to be 12-14 months old. He is not using either of his back legs - he sort of hops with his front legs and swings his back end forward. X-rays revealed his spinal cord is severed at the level of the tail and lower back. This area houses the nerves that control bladder, colon, and back leg function. Val was likely hit by a car to sustain this amount of damage to his spine. He is on strong pain medication and is warm, fed, and safe. We are all so thankful to Valerie for contacting GALT. Unfortunately, the damage to Val's spinal cord is irreversible. 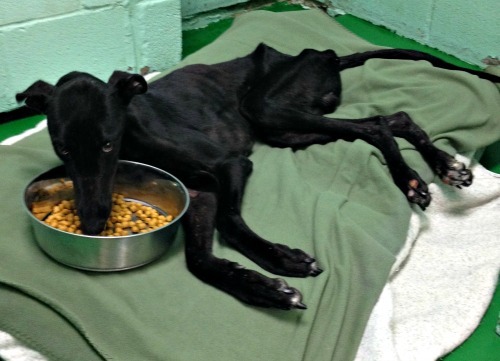 GALT's veterinarians feel he has no possibility of recovery with any quality of life. Val was in loving arms as he left us for the Rainbow Bridge today, November 3, 2014, and we can only be thankful that he is no longer in pain and that his last days were made as comfortable as possible.